Amish Round Tables. Space age styling meets solid wood to make this set as unique as those that decide to make it part of their home. 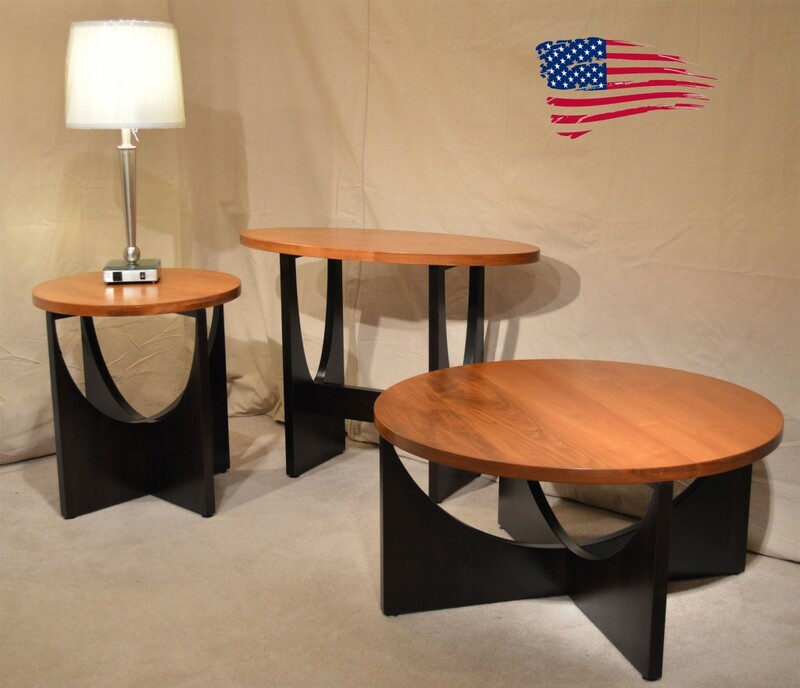 Tables feature futuristic styling, 1.25″ tops, 4 point bases, and two-tone finish. Available in single tone, custom size, and any wood specie you desire. Made in USA! Amish Round Tables features catalyzed finish for an exceptional lifetime durability, plethora of style, finish colors, two tone options available, custom sizes, custom shapes, custom edge detail, and wood specie options in solid (oak, maple, cherry, rustic cherry, tiger oak (quarter sawn white oak), rustic tiger oak, tiger maple, walnut, grey elm, hickory, hard maple).